Jeshurun Christian Global Campus is pleased to offer a Scripture-based homeschooling education for 9th – 12th grade students with a particular focus on missionary kids (MK). Students will engage with the material in a learning environment that provides not only academic growth but also character development and an understanding of one’s identity as a child of God in an increasingly globalized world. The curriculum will follow a two-semester track with the academic year beginning in the fall and ending in the spring. Since Global Campus is the online learning program of Jeshurun Christian School, students will “take classes” and interact with the teacher over uploaded video lectures, skype tutoring sessions and email communication. All of the academic work including assignments, deadlines, evaluations etc. will be handled by the teacher and the student will be informed of the work that they will have to complete each day. While not every lesson will be “taught” by the teacher since the curriculum is founded upon a homeschooling approach, regular reviews and check-ups will take place to ensure the students have a solid grasp of the learned material. Please note that we follow a North American curriculum, which fulfills the HS graduation requirements that students interested in attending college in the US will need to complete. · Core courses (mandatory): Bible, English, Math, Science, Social Studies, foreign language. Please click here to view a sample highschool curriculum listing the individual class titles and the required primary textbook for each class. Please refer to the brochure for further information. Students will also be evaluated on these subjects and grades will be incorporated into their overall GPA. Q. What is homeschooling education? A. Homeschooling education is an increasingly popular movement around the US and the world, in which parents choose to educate their children at home rather than sending them to public or private institutions. Q. If Jeshurun Christian Global Campus follows a homeschooling education, will my student need to complete all of the studies independently on his/her own? A. No, sufficient support will be provided. It is important to note that while the curriculum adopts a homeschooling system of learning and all of the textbooks can be self-taught, full-time teachers will be available to assist the student whenever necessary. Sufficient secondary resources will also be provided to the student at the beginning of the year for the different topics from other educational platforms (ex. Khan Academy, K12, PBS Learning Media etc.). Q. What kind of technical support is required for online learning at Jeshurun Christian Global Campus? A. Students will need access to a computer with internet access, webcam, Microsoft Word, Powerpoint, microphone etc. Q. How will students submit their assignments? A. All assignments will be uploaded onto the server and/or directly emailed to the teacher as an assignment by the given due date. Q. How can the student request help if they need assistance or have questions on their work? A. Students are encouraged to email their teacher at any point with any questions or concerns that they may have. Students can also request for real-time tutor help via skype by scheduling for an appointment in advance. Q. Is there an online gradebook? A. Yes. 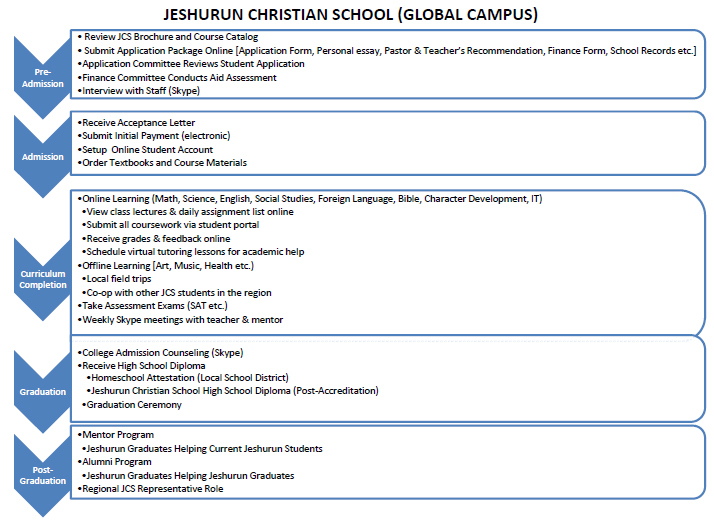 Jeshurun Christian Global Campus uses the ThinkWave program which allows all teachers, students and parents to also view the grade report and assignment history of the students. Q. Is Jeshurun Christian Global Campus accredited? A. Not yet, but we are in the process of becoming an accredited institution. Q. Can students receive a diploma if they graduate from Jeshurun Christian School? A. Yes, students will be able to receive a diploma upon the completion of their studies demonstrating that they have graduated from highschool. In the event that certain colleges do not accept this diploma, students will have the option of taking the TASC (Test Assessing Secondary Completion) to demonstrate that they have completed the requirements for HS graduation.